Australian Labradoodle Male or Female? 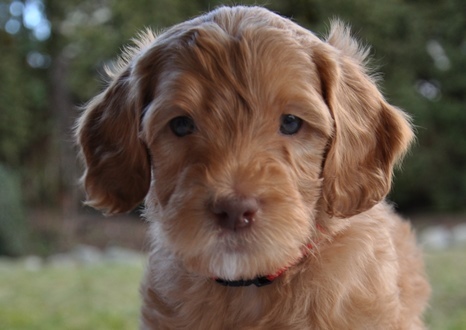 Here at Labradoodles of the North, we’ve found that the number one thing to consider is personality, not gender. Make sure to inform your breeder about what you are looking for in your dog. Do you have young children? Other pets? Are you active? What type of training do you plan on doing with your dog? All of this information will help your breeder match you up with the pup that would best suit you. We bring someone in to our home when the puppies are 6.5 weeks old in order to do Temperament Testing with each puppy. The pups are run through a series of different stimuli and their reactions are scored. Some pups tend to be more outgoing and confident while others may be a bit quieter and more laid back. Like children, each puppy has a particular disposition and we evaluate each puppy in order to help place each puppy into a home where they’ll thrive. For first time dog owners, we’ll often look towards a puppy who is smart, highly treat motivated, makes great eye contact and is eager to please. This will go a long way in helping new dog owners train their dog. For families with young children, we’ll often look towards a puppy that recovers quickly from being startled, not much ruffles his/her feathers and the pup is up for anything. Also, it’s important that the family is matched with a pup that recognizes and accepts child leadership easily. For a retired couple, we’ll often look towards a puppy who isn’t the busiest pup in the litter but loves attention, going for walks and greeting visitors. A puppy who is calm yet confident and loves companionship is often a great choice for empty nesters. For the working couple, we’ll often look towards a puppy who is independent enough to be happy on their own during the working day and won’t suffer from separation anxiety while on their own. These are just some typical scenarios but we’ll work with you and your family to help choose a puppy for you that will be an easy fit into your home. Our number one priority when matching families with puppies is Temperament/Personality. Following that, we attempt to meet specific preferences for gender and color. 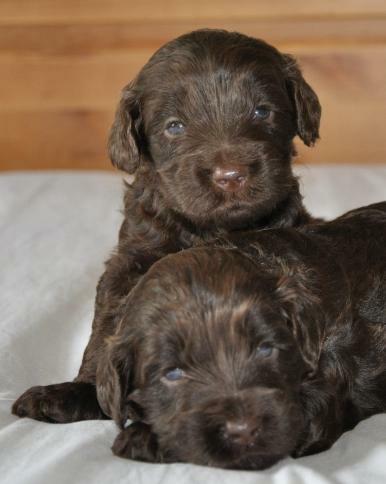 Male and female Australian Labradoodles make equally good family companions.